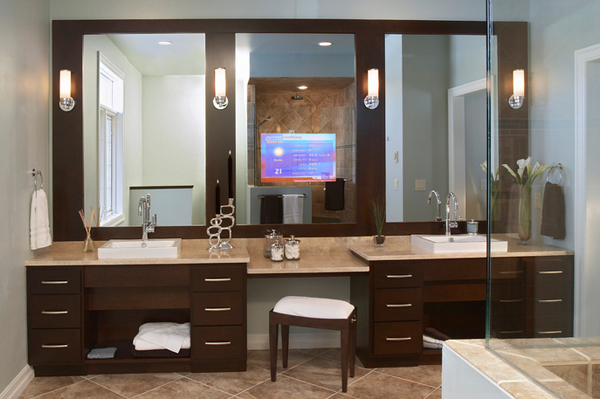 If you love make-up like most women do, make-up vanities are most likely a necessity for you in the bathroom – sometimes, if you couldn’t afford it or you lack the space in the bathroom, you can just opt for one stunning head-to-toe mirror to allows you to see your reflection every time you are taking a bath or dressing up. 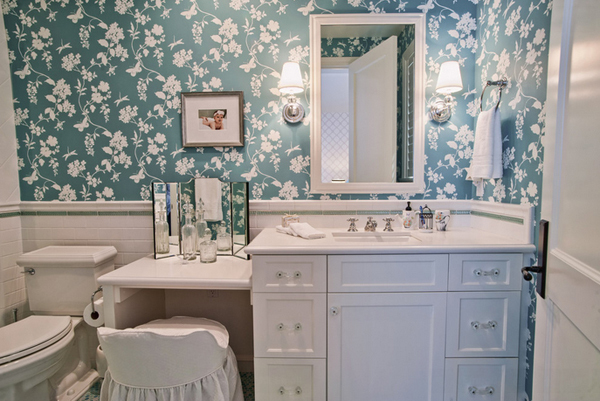 Today, we have a list that will show you a couple of lovely examples of make-up tables or vanities that was added to the bathroom of these lucky home owners! I mean, come on! It’s not always that people add these vanities in their bathrooms – others have a separate room where the vanity is installed or most of the times, in the bedrooms – take a look at the pictures of these wonderfully designed make-up tables with mirrors below. Toe kick lighting – interesting for night-lights when you think about it. With a large family and an always “on the go” lifestyle, a retreat was needed where they could slow down and relax. 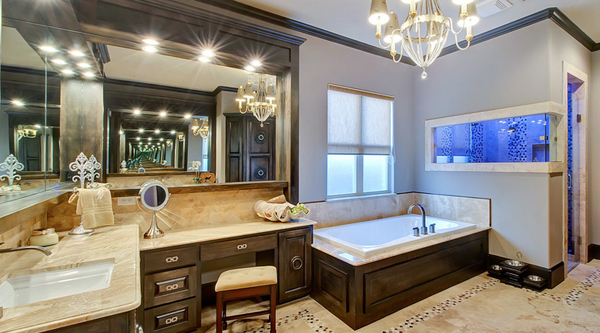 We have here a stunning traditional bathroom that showcase a homey feeling for a bathroom. 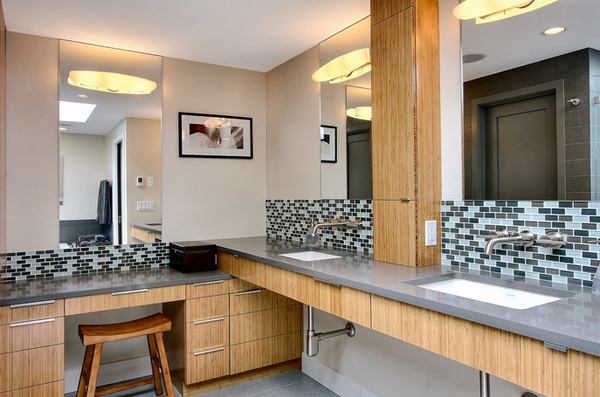 This Seattle bathroom is intended for a large crowd and this sure is beautiful and spacious! 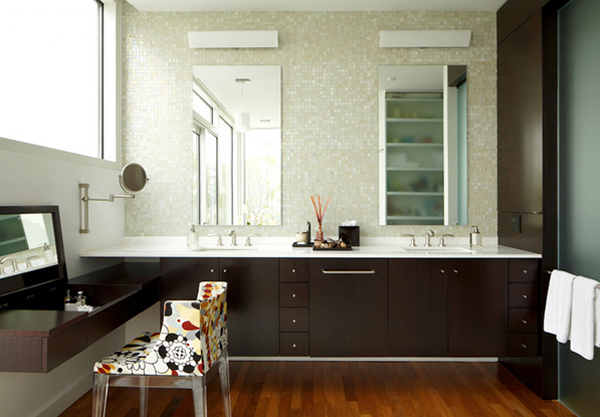 I hope the fabric on the vanity stool be different but all in all, this master bathroom is stunning! This Chicago bathroom is beyond words – double mirrored lavatory and is complemented with a cute stool and lovely neutrals. 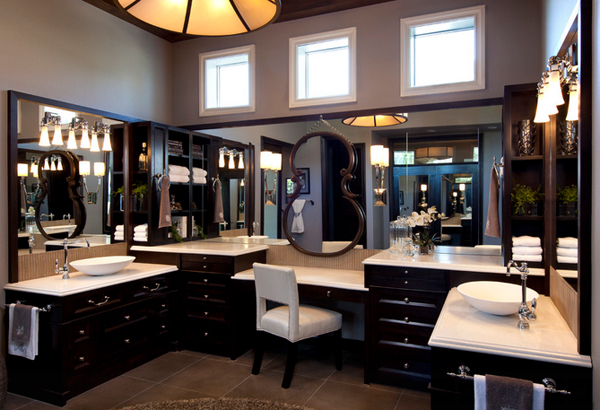 This symmetrical vanity is just divine! The colors used in this space is also deliciously beautiful. 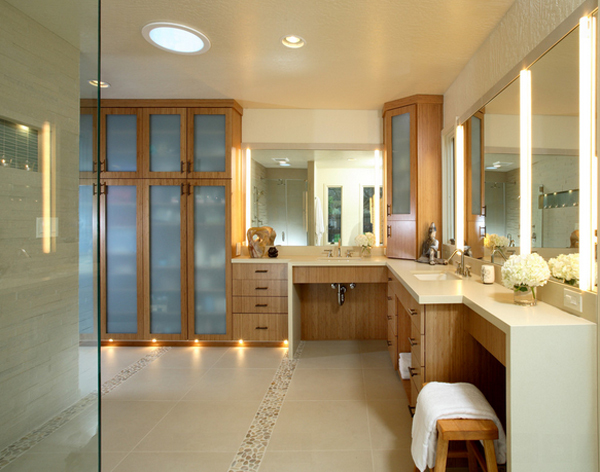 This master bath incorporates both elements of tradition and flair for the modern. 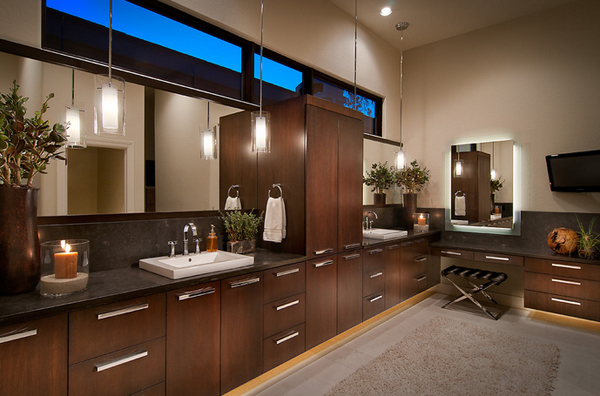 The maple cabinetry at the vanity cabinets features a valance over the mirror with mini-can lighting. Under the mirror is a deco shelf that completes the frame for the mirror. I’m not sure if it’s the window or the tub that is not working it for this Columbus bathroom – but generally speaking, this bathroom is still glorious. Hampton Lane’s bathroom sure looks like a space you’ll see in a cabin in the woods. Haha! 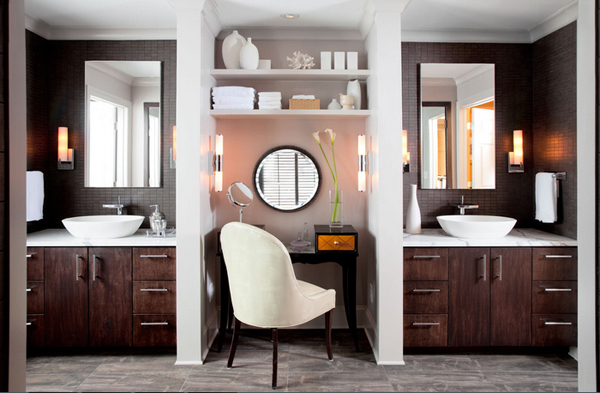 I saw the wall decors first, then the tub – then the awesome vanity with that comfortable stool. 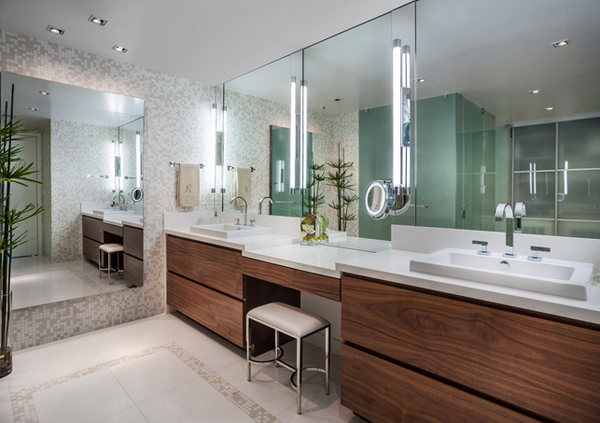 Vertical light bars on the mirrors offer maximum even lighting here, while the lighted swing-arm vanity mirror makes close-up grooming easier. 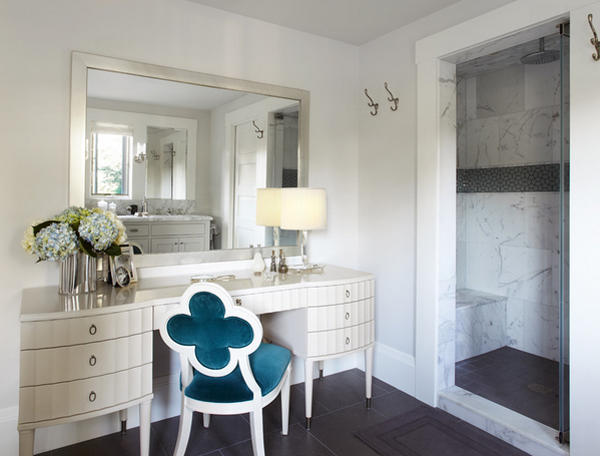 Master bath vanity and full length mirror is the charmer of this Atlanta bathroom. 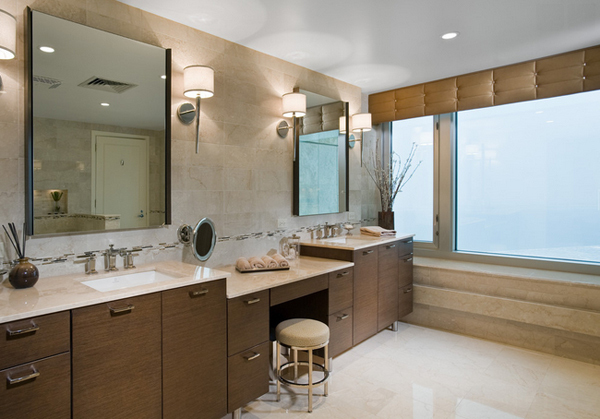 Here is another large space for a bathroom – totally awesome and interesting actually. Even if the make-up vanity is far off in this picture, I can tell you that this one is still stunning in black. The chair in this make-up vanity set is fun even when it is simple. Love the color of the flooring too! This bathroom corner is great in that it’s totally functional and it’s also got a look that my husband would be able to stomach. 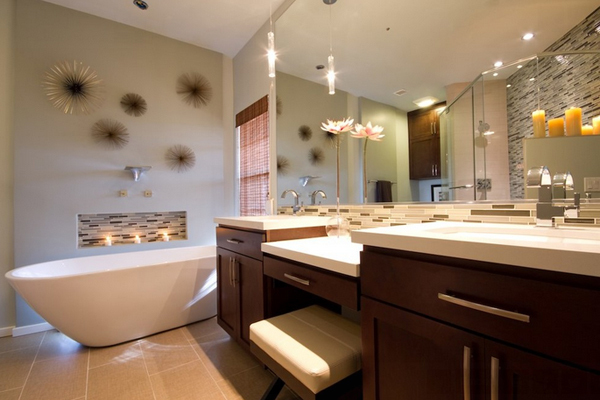 This bathroom is nice and calm, the lighting helps a lot with that because it makes the color seem more calm. The reason they used white color is because it’s the most cool (as is not bright) and it works well indoors. 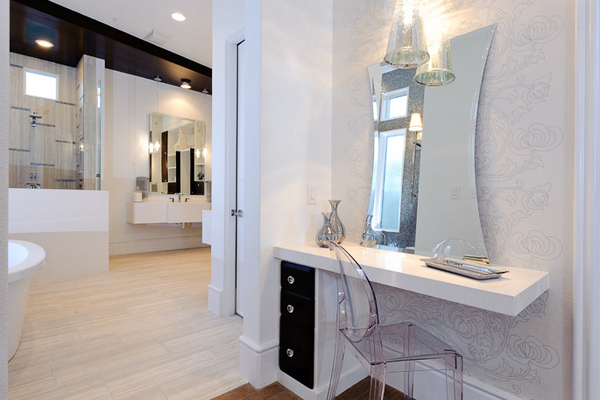 An hourglass mirror in the center reflects onto the other surfaces in the room, creating a 3-D look. Always consider your curb a potential tripping hazard. A curb set with the same tile as the shower and bathroom floor can be hard to see for someone with a visual impairment. So, how did you like the spaces above? 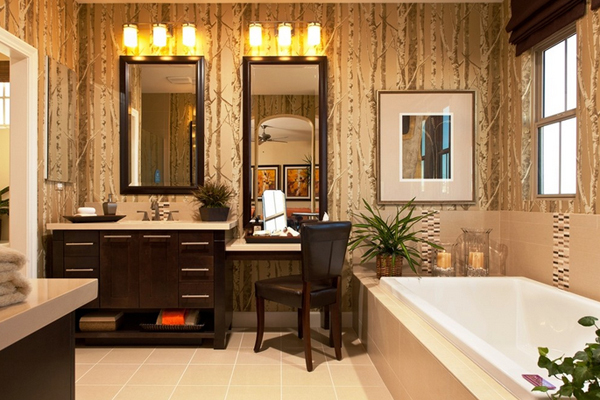 Aren’t they just wonderful spaces to admire and serve as an inspiration for your own personal bathroom? 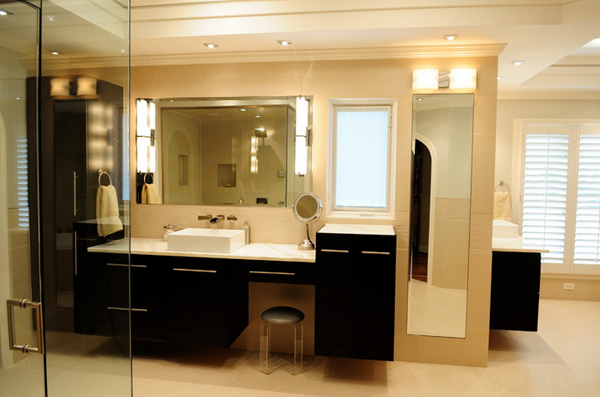 These bathrooms are indeed divine spaces just like the vanity in the bedrooms except that these ones are set up or added in the bedrooms. If you have noticed, the difference is that most of the make-up tables in the bathroom is installed and the ones in the bedroom are only added on the space.